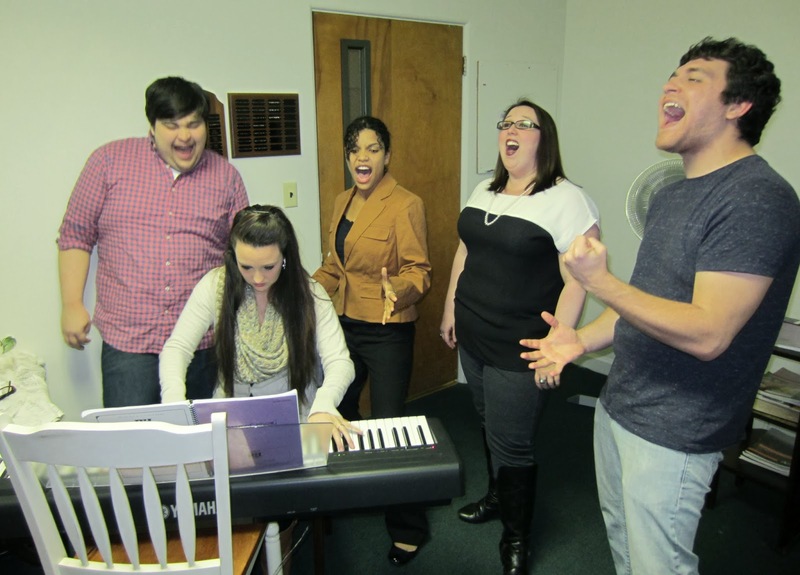 The Performing Arts Laboratory, a production company that is home of Vocal Blast as well as a voice/acting studio, is proud to announce their upcoming production [title of show] in 35below at Asheville Community Theatre March 6-22, 2014. Performances are Thursday, Friday and Saturday nights at 7:30 pm. All tickets are $15.00 and are available online, by phone, or in person at the Asheville Community Theatre Box Office. And yes, the title of the show is [title of show]. [title of show] is a one-act musical, with music and lyrics by Jeff Bowen and a book by Hunter Bell. The show chronicles its own creation as an entry in the New York Musical Theatre Festival, and follows the struggles of the author and composer/lyricist and their two actress friends during the initial brief (three-week) creative period, along with subsequent events leading up to the show's production. [title of show] was chosen for production by the Musical Theatre Festival and premiered there, in September 2004, in New York City. It later ran off-Broadway at the Vineyard Theatre in 2006, earning a second limited run the same year, then played at Broadway's Lyceum Theatre in 2008 for 13 previews and 102 regular performances. Writer/stars Bowen and Bell, as well as director Michael Berresse all won Obie Awards for their work on the off-Broadway production, and Bell was nominated for a Tony Award for Best Book of a Musical. [title of show] runs March 6-22, 2014 in 35below at Asheville Community Theatre. Tickets are available in advance online at www.ashevilletheatre.org or by calling 828-254-1320. Purchasing tickets in advance is strongly recommended. For more information about the Performing Arts Laboratory, please visit www.AvlPALab.org.